The activities of Serbian Puzzle Association are going to be popularization of all types of puzzles, as well as organizing puzzle tournaments. The Eleventh Serbian Open Championship in Optimizers is over. New champion is Zoran Tanasić from Serbia. Second is Milovan Kovačević from Serbia, and the third is Krešimir Stracenski from Croatia. There were 15 competitors from nine countries. The author of the puzzles was Jovan Novaković. You may look at complete standings. All solutions are here. Congratulations Zoran, Milovan and Krešimir. The Tenth Serbian Open Championship in Optimizers is over. New champion is Milovan Kovačević from Serbia. He had one point more then Marko Obradović. Third came Zoran Tanasić. There were 15 competitors from eight countries. The author of the puzzles was Nikola Živanović. You may look at complete standings, points per puzzle and some of the best solutions. All solutions are here. The Tenth Serbian Championship in Solving Optimizing Puzzles has started. You can download the puzzles. Please send your solutions till Monday December 18th, 10 PM CET to answers@puzzleserbia.rs. The Tenth Serbian Optimizing Puzzle Championship will be held from 08.12.2017 till 17.12.2017. The author of the puzzles is Nikola Živanović. There will be three optimizing puzzles. The rules of the contest with the puzzles will be posted on this website on 08.12.2017 00:00 A.M. Central European Time (CET=GMT+01.00). The Ninth Serbian Open Championship in Optimizers is over. For third time in a row, the champion is Tomoaki Tokunaga from Japan, who rather convincingly took the title getting the best score on all the puzzles. Second came Victor Boiko from the Ukraine, and the third is the new champion of Serbia, Čedomir Milanović. There were 16 competitors from eight countries. Among Serbian contestants, the second was Zoran Tanasić, and the third Nikola Živanović. You may look at complete standings, points per puzzle and some of the best solutions. The Ninth Serbian Championship in Solving Optimizing Puzzles has started. You can download the puzzles. Please send your solutions till Sunday December 18th, 8 PM CET to answers@puzzleserbia.rs and to puzzleserbia@gmail.com. The ninth Serbian championship in solving optimizing puzzles will be held from 02.12.2016. 8 P.M. to 18.12.2016. 8 P.M. Central European Time (CET=GMT+01.00). There will be 4 optimizer problems. Competitors choose three puzzles wich will be scored, except authors of puzzles. Authors are: Marko Obradović, Milovan Kovačević, Čedomir Milanović and Zoran Tanasić. The rules of the contest with the puzzles will be posted on this website on 02.12.2016. in 8 P.M. Central European Time. The Eighth Serbian Open Championship in Optimizers is finished. Tomoaki Tokunaga from Japan has successfully defended last year's title, being one point in front of new champion of Serbia, Zoran Tanasic. Rauno Parnits from Estonia came third. There were 17 competitors from nine countries. Among Serbian contestants, the second was Nikola Zivanovic, and the third Milovan Kovacevic. You may look at complete standings, points per puzzle and some of the best solutions. The author of the puzzles for this championship was Marko Obradović. The Eighth Serbian Championship in Solving Optimizing Puzzles has started. You can download the puzzles. Please send your solutions till Monday December 28th, 11 PM CET to answers@puzzleserbia.rs and to puzzleserbia@gmail.com. The eighth Serbian championship in solving optimizing puzzles will be held from 18th to 27th December. The rules of the contest will be published together with the puzzles on December 18th in the evening. Tomoaki Tokunaga from Japan was impressive and triumphed with maximum of 75 points. The second is Victor Boiko from Ucraine (61 points) while the third and also the best placed competitor from Serbia is Čedomir Milanović with 49 points. A total of 14 contestants from 9 countries took part in the championship. Complete results and the results by the puzzles can be seen here and three best solutions of each puzzle can be seen here. The author of the puzzles for this championship was Zoran Tanasić. Thanks to all participants and we hope you enjoyed it! You can find new version of programs with correct program for first puzzle and example for third puzzle. The seventh Serbian Open Championship in solving optimizing puzzles has started. 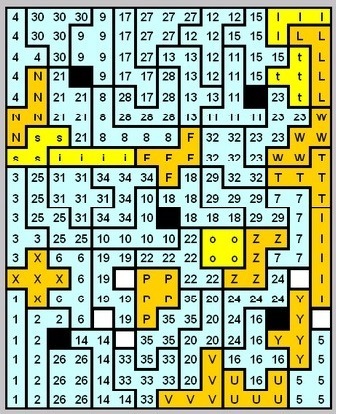 You can find puzzles in word and pdf format. For solving puzzles you can find programs that can be used. The author of the puzzles is Zoran Tanasić. Solutions should be sent on answers@puzzleserbia.rs. The deadline for sending the solution is 8.12. (Monday) 18:00. (GMT+1). Discussion is open on link. Good luck! The seventh Serbian championship in optimizers will take place from November 28th till December 8th 2014. 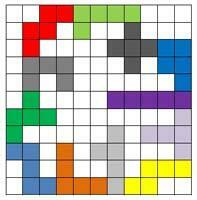 It consists of one round and three puzzles which are scored separately. All necessary details will be announced in the together with the puzzles on Friday, November 28th, 6 PM. The winner of Sixth Serbian Open Championship in Optimizers is Milovan Kovačević with 28 points. The second place was taken by Marko Obradović and Tomoaki Tokunaga (JPN) (27 points) and fourth place was taken by Zoran Tanasić (26). There were overall 24 participants from nine countries. Unfortunately, there were lots of incorrect solutions, particularly of the third puzzle. There were various mistakes: letter triplets, repeated words, even misspelled words, so those competitors scored 0 on the puzzle. You can look at the complete standings, scores per puzzle and some of the best solutions. The author of the puzzles was Nikola Živanović. We thank all the participants and we hope you enjoyed the contest. The Sixth Serbian Open Championship in solving optimizing puzzles has started. Puzzles in word and pdf formats have been posted. Solutions should be sent on answers@puzzleserbia.rs. The deadline for sending the solution is 8.12. (Sunday) 22:00. (GMT+1). Good luck! The sixth Serbian championship in optimizers will take place from November 29th till December 8th 2013. 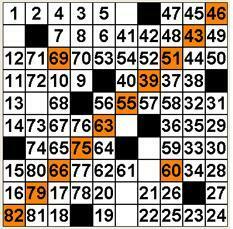 Unlike the preceding ones, it consists of only one round and three puzzles which are scored separately. All necessary details will be announced in the together with the puzzles on Friday, November 29th, 9 AM. The winner of Fifth Serbian Open Championship in Optimizers is Milovan Kovačević with 137 points (out of maximal 150). In the second round Milovan managed to overtake the second placed Branko Ćeranić and the first round leader Zoran Tanasić who eventually finished second with 133 points. The third and fourth place was taken by James McGowan of New Zealand and Branko Ćeranić, both with 132 points (James had four 25s, while Branko had three). Branko took the third place among Serbian competitors. There were overall 26 participants from eight countries. You can look at the complete standings, scores per puzzle and some of the best solutions. The author of the puzzles was Nikola Živanović. We thank all the participants and we hope you enjoyed the contest. In the first round of the Fifth Serbian Open Championship in Optimizers there were 25 competitors from 8 countries. After the first round the leader is Zoran Tanasić with 71 points, over Branko Ćeranić (68) and Milovan Kovačević (66). You can look at the complete results with scores per puzzle and some of the best solutions. In front of you are second round puzzles. Solutions should be sent on answers@puzzleserbia.rs. The deadline for sending the solution is 9.12. 22:00. (GMT+1). The results of the first round will be posted on Friday, December 7th, the latest. The fifth Serbian Open Championship in solving optimizing puzzles has started. The first round puzzles have been posted. Solutions should be sent on answers@puzzleserbia.rs. The deadline for sending the solution is 2.12. (Sunday) 22:00. (GMT+1). Good luck! The fifth Serbian Open Championship in solving optimizer puzzles 26.11.2012. - 9.12.2012. The fifth Serbian Open Championship in solving optimizer puzzles, organized by Serbian Puzzle Association, will start on Monday, November 26th. The contest will last two weeks. It consists of two rounds, seven days each. This year there will be 6 optimizer problems in total, 3 per round. Each puzzle has separate scoring system. The contestant (or contestants) with the best solution receives 25 points, second best solution is worth 21 points, the third 18, the fourth 16, the fifth 14, the sixth 12, the seventh 11, and so on. Seventeenth-ranked competitor gets 1 point. In each round, competitor's score will be the sum of all his results, at most 75 points per round. There is no entrance fee or special application form. Anybody interested can participate. The best Serbian competitor will get the trophy and become national champion for the year 2012. The author of the puzzles is Nikola Živanović. The file with the puzzles for the first round will be posted on this website on Monday, November 26th, 10 A.M. Central European Time (CET=GMT+01.00). The deadline for submiting the answers is Sunday, December 2nd, 10 P.M. The results of the first round will be posted on Friday, December 7th, the latest. The second round begins on Monday, December 3rd. The deadline for the answers is Sunday, December 9th. The final results will be posted on December 14th, the latest. The second round puzzles and programs that can be used have been posted. The document has one correction, if you had downloaded it on 11.12 before 15:00, please download it again! Solutions should be sent through a special form available at the following address. The deadline for sending the solution is 17.12. (Saturday) 24:00. (GMT+1). Good luck! The fourth Serbian Open Championship in solving optimizing puzzles has started. The first round puzzles and programs that can be used have been posted. Solutions should be sent through a special form available at the following address. The deadline for sending the solution is 10.12. (Saturday) 24:00. (GMT+1). Good luck! The first set will be available 03.12. (Saturday) at 12:00 (Belgrade time, GMT+1). Deadline for sending solutions is 10.12. up to 24:00. The second set will be available 11.12. (Sunday) at 12:00. Deadline for sending solutions will be 17.12. up to 24:00. Day after deadline for set, all received solutions will be available. Scoring table will be ready within 48h, and next 48h any complains will be considered - author's decision will be final. After that, final results will be published and winners declared. In finding solutions, or parts of the solution, you may not use the suggestion from any side, including computer programs (a coin flip is allowed). The programs can be used only to calculate result for your solution. For some puzzles we will provide that kind of programs (Delphi for Windows). Lovers of programming are invited to participate in the subsequent analysis. So, optimize your schedule in a such way that your free time is maximized in early December ! The third Serbian open Championship in Optimizers is finished. The winner is Vlad Klyachin from Russia who scored maximum 200 points. The second and the champion of Serbia became Milovan Kovačević from Serbia. The third is Tomoaki Tokunaga from Japan. You can look at the complete results with scores per puzzle, as well as some of the best solutions our competitors came up with. We thank you all for participation and kind words you sent. In the first round of the Third Serbian Open Championship in Optimizers there were 42 competitors from 17 countries. After the first round four people share the leading position: Vlad Klyachin (Russia), Danijel Milošević and Milovan Kovačević (Serbia) and Tomoaki Tokunaga (Japan) All competitors scored at least one point in the first round. 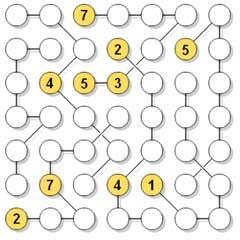 Six competitors scored points in every puzzle. We are looking forward for some great solutions in the second round as well. The first round of Serbian Open Championship in solving optimizing puzzles was successful. There were 39 participants from 16 countries. The results will be posted by the end of the week. There is no time to rest, because second round puzzles are already in front of you. Please send your solutions to our email address answers@puzzleserbia.com. We remind you that the deadline for submitting your answers is Sunday, December 12th, 10 P.M. Central European Time. The third Serbian Open Championship in solving optimizing puzzles has started. The first round puzzles have been posted. Please send your solutions to our email address answers@puzzleserbia.com. We remind you that the deadline for submitting your answers is Sunday, December 5th, 10 P.M. Central European Time. There is no entrance fee or special application form. Anybody interested can participate. The top ten puzzlers will receive awards via email. The best Serbian competitor will get the trophy and become national champion for the year 2010. On the third preliminary contest there were 20 participants. The winner is last week's runner up Jakub Ondroušek from Czech republic, followed by Florian Kirch from Germany and Nikola Živanović from Serbia. You can look at the complete standings as well as the answers our competitors sent. This was the last competition before Serbian sudoku championship which will take place in Pančevo next Sunday. Hope you all enjoyed the puzzles and had fun solving them! The third preliminary contest for the Fifth Serbian Sudoku Championship organized by Serbian Puzzle Association will be held on Sunday, January 24th starting at 12 pm CET (GMT + 1). The puzzle author is Branko Ćeranić. You can download the instructions with examples, as well as the document with actual contest puzzles. All the instructions are given in the instruction file. The password will be available at the answer page together with the answering form. The time for solving is two hours. The answers will be accepted till at most five minutes after the end, with 5 points penalty for each minute. If you have got any questions, you can ask them at Nikola Živanović's blog "Logika". On the second preliminary contest there were 34 participants from 13 countries. The winner is Taro Arimatsu from Japan, with one point advantage over Jakub Ondroušek from Czech republic, and two points advantage over home favourite Branko Ćeranić. The puzzles were rather difficult and nobody managed to solve all of them. 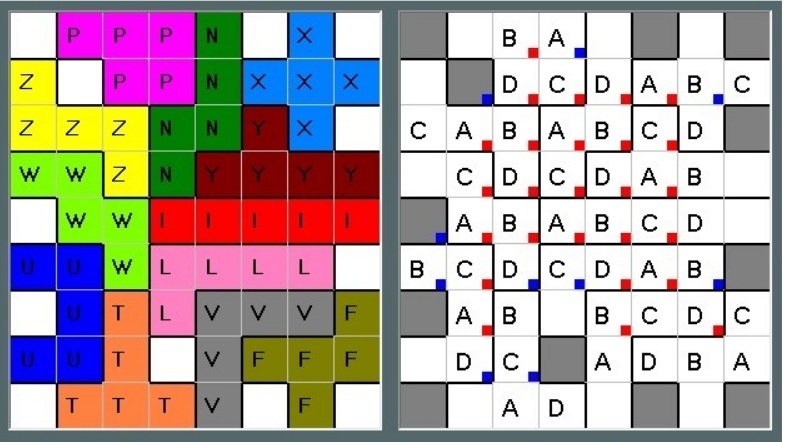 The four best solvers solved ten puzzles each. 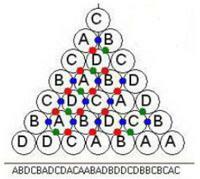 The hardest problem turned out to be number five (hundred), which was solved only by Bojana Vojnović from Serbia. You can look at the complete standings as well as the answers our competitors sent. The second preliminary contest for the Fifth Serbian Sudoku Championship organized by Serbian Puzzle Association willl be held on Sunday, January 17th starting at 12 pm CET (GMT + 1). The puzzle authors are Nikola Živanović and Marko Obradović. You can download the instructions with examples, as well as the document with actual contest puzzles. In this document there won't be any text, all the instructions are given in the instruction file. The document has a small correction, if you had downloaded it on January 14th, please download it again! The password will be available at the answer page together with the answering form. The time for solving is two hours. The answers will be accepted till at most five minutes after the end, with 5 points penalty for each minute. If you have got any questions, you can ask them at Nikola Živanović's blog "Logika". Four more competitors joined in the second round to make total of 57 puzzlers from 19 countries. The winner of this year's competition and Serbian champion became Zoran Tanasić from Belgrade, who made one best and three second best solutions to edge the closest competition for just two points. Tomaoki Tokunaga from Japan was brilliant in the second round making perfect 100 score, but it was not enough for the victory. The third is Milovan Kovačević from Novi Sad, Serbia with the same number of points but weaker tiebraker record. Last year's winner Vlad Klyachin from Moscow, Russia, finished fourth, followed by Čedomir Milanović from Kikinda, Serbia who also made huge improvement in the second round. All competitors but one scored at least one point in the competition. Three competitors scored points in every puzzle in the second round. 1. Knight Moves on Pentominoes: Three puzzlers made the perfect 60 score, but the others also were good, so all the contestants who sent the solution scored at least a point, and those who were patient scored much more. 2. Year of Astronomy : A classical crossword puzzle gave us the usual variety of beautiful solutions. 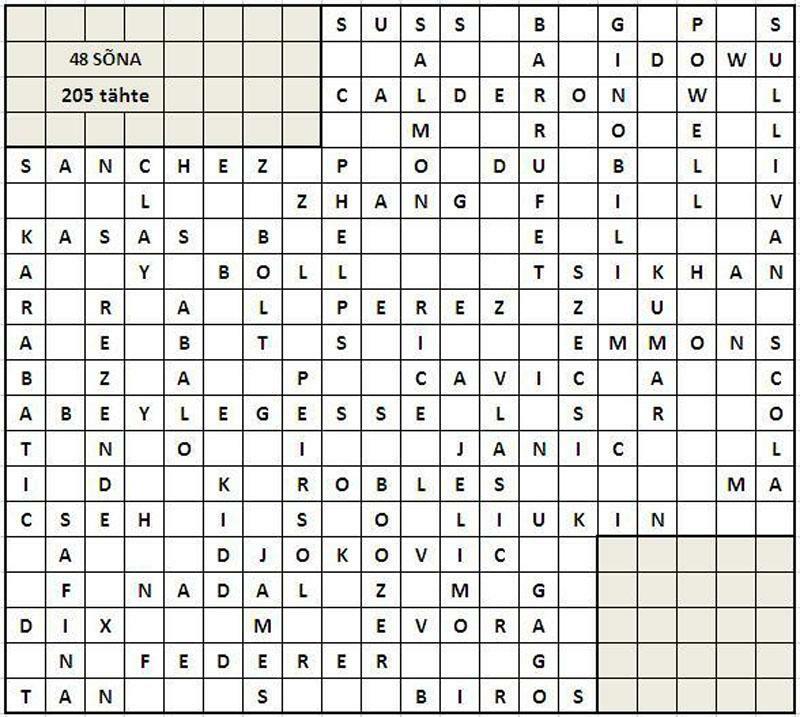 Čedomir Milanović was the best by some margin, with beautiful 3x3 square well placed inside the crossword. 3. Step by Step : This was the most popular puzzle of the second round, and many contestants managed to score over 600. Tomoki Tokunaga was the best by far, as he outscored the second competitor by a greater margin than the second outscored the tenth. 4. Archery: A very difficult puzzle, at it turned to be the most unfortunate one. We are sorry for the puzzlers who made a mistake on this puzzle, because they got 0 score. There was simply no way to recover any score if a number showed the wrong number of arrows. Tokunaga once again showed his skill and made another impressive result. 5. 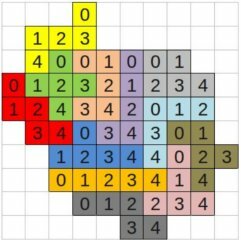 Hit the Score : Probably the easiest puzzle of the whole contest, 24 participants found the optimal solution, and almost all who sent the solution scored at least a point on this puzzle. 6. Mirror, Mirror, on the Wall : Although it did not seem that this puzzle would produce a great variety of solutions, it was quite the opposite. Many contestants used some different techniques to increase the number of mirrors hit. Three of them found 46 hits, but two best managed to distribute them more evenly and got the top score. Interestingly, the two top solutions were almost identical, only one had the queen's beam finish at a dwarf, other at the edge of the grid. 1. Zoran Tanasić (Belgrade, Serbia) 177, 2. Tomaoki Tokunaga (Japan) 175, 3. Milovan Kovačević (Novi Sad, Serbia) 175, 4. Vlad Klyachin (Moscow, Russia) 169, 5. Čedomir Milanović (Kikinda, Serbia) 160, 6. Patrick Hinz (München, Germany) 155, 7. Rade Goljović (Baljevac, Serbia) 153, 8. Štefan Gyürki (Salov, Slovakia) 145, 9. Urmas Raude (Muuga, Estonia) 141, 10. Rainer Biegler (Aix-la-Chapelle, Germany) 131, 11. Danijel Milošević (Belgrade, Serbia) 128, 12. Nikola Živanović (Sombor, Serbia) 124, 13. Branko Ćeranić (Pančevo, Serbia) 122, 14. Oddest Wu (Taipei, Taiwan) 119, 15. Sebastian Matschke (München, Germany) 117, 16. Nenad Savić (Belgrade, Serbia) 114, 17. Stefano Forcolin (Manchester (UK), Italy) 114, 18. Gerhard Richter (Jena, Germany) 103, 19. Zafer Huseyin Ergan (Eskisehir, Turkey) 100, 20. Davor Gavranović (Belgrade, Serbia) 98, 21. Ruey Lu (Taipei, Taiwan) 97, 22. Dragan Stojanović (Boleč, Serbia) 95, 23. Alan O'Donnell (Edinbourgh, UK) 89, 24. Gulcin Sabanci (Izmir, Turkey) 87, 25. Bojana Vojnović (Belgrade, Serbia) 87, 26. Liane Robinson (Oldham, UK) 86, 27. Jiri Hrdina (Roztoky u Jilemnice, Czech republic) 85, 28. Andrzej Zolynski (Zielona Góra, Poland) 80, 29. Dragan Tolomanoski (Sarajevo, Bosnia and Herzegovina) 77, 30. Anatoliy Kaymerchuk (Ivano-Frankivsk, Ukraine) 76, 31. Frank Föll (Karlsruhe, Germany) 72, 32. Marcin Zanechal (Bratislava, Slovakia) 72, 33. Rauno Pärnits (Tartu, Estonia) 70, 34. Petar Parlić (Skoplje, Macedonia) 68, 35. Vidan Đurić (Banatski Karlovac, Serbia) 66, 36. Luka Pavičić (Split, Croatia) 66, 37. Harmeet Singh (Bangalore, India) 53, 38. Sergey Buhanevich (Sankt-Petersburg, Russia) 51, 39. Robert Bearda (Hoofddorp, Netherlands) 51, 40. Hans-Dieter Hinz (Buchholz, Germany) 50, 41. Simana Matković (Sombor, Serbia) 47, 42. Ravi Kumar Macherla (Visakhapatnam, India) 45, 43. Ladislav Bielik (Sereď, Slovakia) 40, 44. Jovan Novaković (Požarevac, Serbia) 39, 45. Michaela Bieliková (Sereď, Slovakia) 36, 46. Zoltán Horváth (Veresegyhaz, Hungary) 35, 47. Rohan Rao (Mumbai, India) 29, 48. Georg Filser (Bad Wörishofen, Germany) 25, 49. Matus Demiger (Zlate Moravce, Slovakia) 23, 50. Ranka Novaković (Požarevac, Serbia) 23, 51. Anurag Sahay (Hyderabad, India) 21, 52. Iida Takahisa (Yokohama, Japan) 17, 53. Zoran Radisavljević (Novi Sad, Serbia) 15, 54. Zuzana Hromcova (Bytca, Slovakia) 11, 55. Shanta Murthy (Mumbai, India) 10, 56. Slavko Bovan (Kikinda, Serbia) 9, 57. Samuel Wei (Taipei, Taiwan) 0. You can look at the complete final results and scores per puzzle, as well as some of the best solutions from this round. We hope you found our puzzles enjoyable. We are pleased with the number of participants and we thank you all for your kind words. Hope to see you again next year. In the first round of the Second Serbian Open Championship in Optimizers there were 53 competitors from 18 countries. After the first round the leader is Milovan Kovačević from Novi Sad, Serbia, with four points advantage over Zoran Tanasić from Belgrade, Serbia. The last year's winner Vlad Klyachin from Moscow, Russia, currently occupies the third place, followed by two debutants, Rade Goljović from Baljevac, Serbia and Stefan Gyürki from Salov, Slovakia. All competitors but one scored at least one point in the first round. 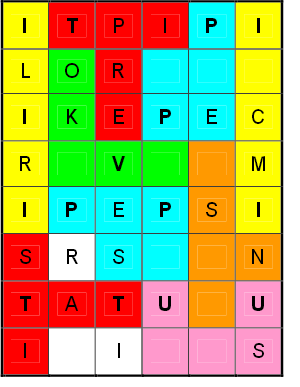 Four competitors scored points in every puzzle. 1. Puzzle Serbia: The example given unfortunately turned out to be too good (or bad), so the competitors (13 of them) who used it as a base of their solution got the best result. 2. 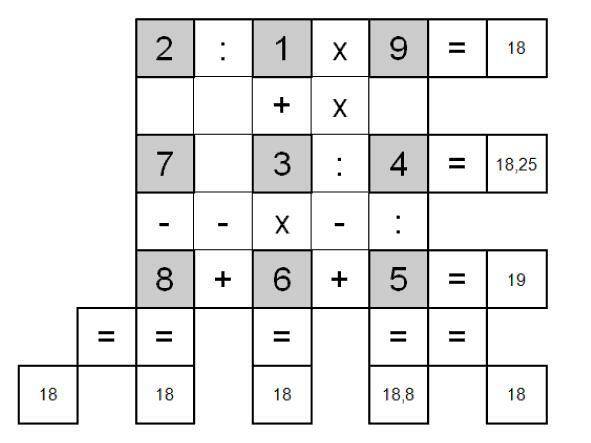 Geomathematics: All participants (except Nikola Živanović, the author) submitted their answers for this puzzle and 9 of them found the optimal solution. The right path was to sacrifice some columns in order to increase the value of the key letters. Those who chose S and N turned out to be winners. Worth mentioning is the solution found by Petar Parlić. It was quite close to the optimal one, even though he used only one word from the optimal solution. 3. 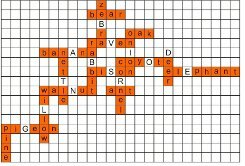 Retrospect Word Search: Although the least number of puzzlers submitted their answers, this puzzle had the greatest variety of the solutions. The key was to spot three-letter overlaps and use them wisely while trying to maximize the number of used (short) words. The best solution by Nikola Živanović, breaking the 400 points limit is a fantastic effort. 4. 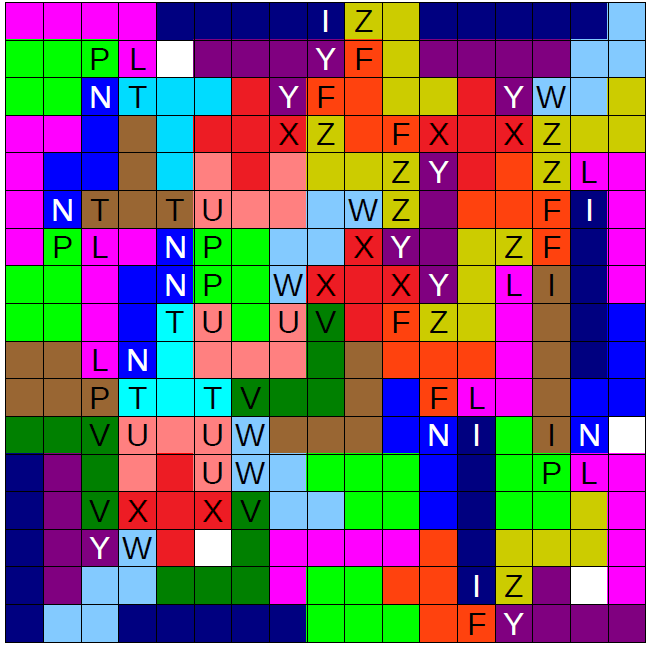 Triplets: This puzzle, together with puzzle 2, had the highest number of solvers. Quite a few got the result higher than 22000, and seven of them got over 22800. 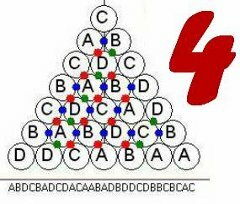 But, the best three chose to sacrifice one "9" and increase other addends for even better score. Last year's winner, Vlad Klyachin, got the final finesse right and outscored the rivals by 1 sole point! 5. European Flags: Because the range of possible scores for this puzzle was rather narrow, all competitors who submitted their answer got on the scoresheet. 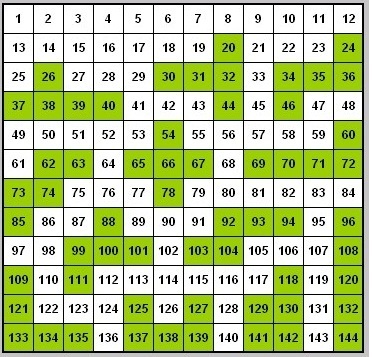 Although the puzzle was simple, there were a lot of combinations and the best combiners managed to make all possible 19 rectangles, with only 2 isolated squares, for a total of 17. Nenad Savić also got 17, but in a different way: 18 rectangles, 1 isolated square, and 1 L-shaped area. 6. In the Museum: All competitors who sent the correct solution got on the scoresheet, the scores were close, but the paths through the museum were very different. Jiri Hrdina managed to make 83 without touching the path even once, and Gulcin Sabanci scored only 53 but was the only one to visit all exhibits. Defending champion, Vlad Klyachin, once again showed his skills and scored 91 missing only 2 exhibits. Altogether with its symmetry, his solution looks like a real masterpiece. 1. Milovan Kovačević (Novi Sad, Serbia) 93, 2. Zoran Tanasić (Belgrade, Serbia) 89, 3. Vlad Klyachin (Moscow, Russia) 86, 4-5. Rade Goljović (Baljevac, Serbia) 85, 4-5. Stefan Gyürki (Salov, Slovakia) 85, 6. Patrick Hinz (>München, Germany) 83, 7. Danijel Milošević (Belgrade, Serbia) 80, 8. Urmas Raude (Muuga, Estonia) 80, 9. Branko Ćeranić (Pančevo, Serbia) 78, 10. Nikola Živanović (Sombor, Serbia) 77, 11. Tomaoki Tokunaga (Japan) 75, 12. Čedomir Milanović (Kikinda, Serbia) 73, 13. Nenad Savić (Belgrade, Serbia) 68, 14. Rauno Pärnits (Tartu, Estonia), 15. Dragan Stojanović (Boleč, Serbia) 60, 16. Stefano Forcolin (Manchester (UK), Italy) 57, 17. Rainer Biegler (Aix-la-Chapelle, Germany) 57, 18. Bojana Vojnović (Belgrade, Serbia) 57, 19. Zafer Huseyin Ergan (Eskisehir, Turkey) 54, 20. Petar Parlić (Skoplje, Macedonia) 53, 21. Oddest Wu (Taipei, Taiwan) 52, 22. Liane Robinson (Oldham, UK) 50, 23. Frank Föll (Karlsruhe, Germany) 49, 24. Dragan Tolomanoski (Sarajevo, Bosnia and Herzegovina) 49, 25. Gerhard Richter (Jena, Germany) 48, 26. Marcin Zanechal (Bratislava, Slovakia) 46, 27. Ruey Lu (Taipei, Taiwan) 45, 28. Alan O'Donnell (Edinbourgh, UK) 44, 29. Sebastian Matschke (München, Germany) 45, 30. Andrzej Zolynski (Zielona Góra, Poland) 43, 31. Vidan Đurić (Banatski Karlovac, Serbia) 41, 32. Davor Gavranović (Belgrade, Serbia) 41, 33. Ravi Kumar Macherla (Visakhapatnam, India) 41, 34. Robert Bearda (Hoofddorp, Netherlands) 40, 35. Luka Pavičić (Split, Croatia) 40, 36. Jiri Hrdina (Roztoky u Jilemnice, Czech republic) 40, 37. Anatoliy Kaymerchuk (Ivano-Frankivsk, Ukraine) 39, 38. Hans-Dieter Hinz (Buchholz, Germany) 38, 39. Simana Matković (Sombor, Serbia) 37, 40. Harmeet Singh (Bangalore, India) 36, 41. Gulcin Sabanci (Izmir, Turkey) 35, 42. Rohan Rao (Mumbai, India) 29, 43. Matus Demiger (Zlate Moravce, Slovakia) 23, 44. Ranka Novaković (Požarevac, Serbia) 23, 45-46. Michaela Bieliková (Sereď, Slovakia) 21, 45-46. Jovan Novaković (Požarevac, Serbia) 21, 47. Georg Filser (Bad Wörishofen, Germany) 20, 48. Ladislav Bielik (Sereď, Slovakia) 18, 49. Zoran Radisavljević (Novi Sad, Serbia) 15, 50. Zuzana Hromcova (Bytca, Slovakia) 11, 51. Shanta Murthy (Mumbai, India) 10, 52. Slavko Bovan (Kikinda, Serbia) 9, 53. Anurag Sahay (Hyderabad, India) 0. You can look at the complete results and scores per puzzle, as well as some of the best solutions our competitors came up with. The first round of Serbian Open Championship in solving optimizer puzzles was successful. There were more than 50 participants from 17 countries. The results will be posted by the end of the week. We would like to apologize to Estonian puzzlers for mixing up the colors of their flag in puzzle 5. Who knows, maybe if the flag was drawn correctly, it would have been possible to get higher scores. There is no time to rest, because second round puzzles are already in front of you. Please send your solutions to our email address answers@puzzleserbia.com. We remind you that the deadline for submitting your answers is Sunday, December 13th, 10 P.M. Central European Time. The Second Serbian Open Championship in solving optimizer puzzles has started. The first round puzzles have been posted. Please send your solutions to our email address answers@puzzleserbia.com. We remind you that the deadline for submitting your answers is Sunday, December 6th, 10 P.M. Central European Time. The second Serbian Open Championship in solving optimizer puzzles, organized by Serbian Puzzle Association, will start on Monday, November 30th. The contest will last two weeks. It consists of two rounds, seven days each. There is no entrance fee or special application form. Anybody interested can participate. The top ten puzzlers will receive awards via email. The best Serbian competitor will get the trophy and become national champion for the year 2009. The authors of the puzzles are Marko Obradović (8 puzzles) and Nikola Živanović (4 puzzles). Since there will be only two of his puzzles in each round, Nikola has the right to participate, but, of course, not to submit the answers for his own puzzles. The file with the puzzles for the first round will be posted on this website on Monday, November 30th, 10 A.M. Central European Time (CET=GMT+01.00). The deadline for submitting the answers is Sunday, December 6th, 10 P.M. The results of the first round will be posted on Friday, December 11th, the latest. The second round begins on Monday, December 7th. The deadline for the answers is Sunday, December 13th. The final results will be posted on December 18th, the latest. The contest for best logic innovative puzzle organized by Serbian Puzzle Association is finished. There were 28 puzzles sent by 9 authors. The members of the jury, Zoran Tanasić, Nikola Živanović and Rohan Rao made their voting and the winner of the contest became Dragan Tolomanoski form Sarajevo, Bosnia and Herzegovina with his puzzle "Fleet in fenced octopus". You can look at his puzzle, as well as the complete voting table of the jury. The eighteen puzzles that received at leat one point together with two puzzles by Nikola Živanović will be presented on his blog Logika within the section "Logički novitetii", one puzzle each week. Vlad Klyachin from Moscow, Russia, is the winner of the First Serbian Open Championship in Optimizers. In the second round, he solved six puzzles for a "perfect ten" and surpassed Marko Obradović from Belgrade, Serbia. Finishing second, as the best home competitor, Marko Obradović became the champion of Serbia for the year 2008. Zoran Tanasić from Belgrade, Serbia, took the third place. As expected, the second round was as successful as the first. The solutions were sent by 32 puzzlers from 13 countries, among them one who did not take part in the first round. In the second round the only contestant who scored points in all the puzzles was Zoran Tanasić. The biggest leap was made by Zoran Radisavljević from Novi Sad, who jumped up from 23rd to 11th place. It is interesting that the additional tiebreaker rule was used to decide 27th place. Simana Matković and Bjoern Roesel were tied with the same score. 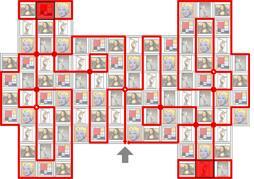 As German puzzler did not send the answer for "Four in the Row Around Serbia", the lady from Sombor won the tiebreaker. 1. Vlad Klyachin (Moscow, Russia) 96, 2. Marko Obradović (Belgrade, Serbia) 90, 3. Zoran Tanasić (Belgrade, Serbia) 78, 4. Milovan Kovačević (Novi Sad, Serbia) 70, 5. Reiner Biegler (Aix-la-Chapelle, Germany) 66, 6. Andrzej Zolynski (Zielona Gora, Poland) 65, 7. Urmas Raude (Muuga, Estonia) 61, 8. Čedomir Milanović (Kikinda, Serbia) 60, 9. Goran Vodopija (Zagreb, Croatia) 54, 10. Nenad Savić (Belgrade, Serbia) 48, 11. Zoran Radisavljević (Novi Sad, Serbia) 47, 12. Lu Pei (Тaipei, Тaiwan (ROC) 44, 13. Dragan Stojanović (Belgrade, Serbia) 44, 14. Dragan Tolomanoski (Sarajevo, Bosnia and Herzegovina) 43, 15. Ravi Kumar Macherla (Visakhapatnam, India) 42, 16. Davor Gavranović (Belgrade, Serbia) 41, 17. Alexander Ershov (Moscow, Russia) 41, 18. Robert Bearda (Hoofddorp, The Netherlands) 41, 19. Jiri Hrdina (Roztoky u Jilemnice, Czech republic) 39, 20. Rohan Rao (Mumbai, India) 35, 21. Iida Takhisa (Yokohama, Japan) 31, 22. Georg Filser (Bad Wörishofen, Germany) 29, 23. Zafer Huseyin Ergan (Eskisehir, Turkey) 28, 24. Harmeet Singh (Bangalore, India) 27, 25. Anurag Sahay (Hyderabad, India) 25, 26. Gulcin Sabanci (Izmir, Turkey) 22, 27. Simana Matković (Sombor, Serbia) 17, 28. Bjoern Roesel (Giessen, Germany) 17, 29. Slavko Bovan (Kikinda, Serbia) 15, 30. Hans-Dieter Hinz (Buchholz, Germany) 10, 31. Tejal Phatak (Mumbai, India) 10, 32. Ivan Bukumirić (Smederevska Palanka, Serbia) 9, 33. Shanta Murthy (Mumbai, India) 6. You can look at the complete results scored per puzzle, as well as some of the best solutions our from the second round. Best Serbian competitors will receive their trophy, medals and awards at Serbian Sudoku Championship which will be held in January. Best foreign competitors will receive their awards via e-mail later this week. The Serbian Open Championship in Optimizers will become a regular event. It will be held once a year, in the autumn, after the World Puzzle Championship. At the end, there is on more thing worth mentioning. Although the competiotion is over, the puzzles are still being solved. A great solution for puzzle number 3 (Olympic Scrabble) was offered to us by Raun Parnits from Estonia. His score of 397 outlasts by far the winning score in the competition at sets the new challenge. Here is his outsanding crossword. We hope that the our puzzles intrigued you and that you will enjoy solving some of them again. In the first round of the First Serbian Open Championship in Optimizers there were 32 competitors from 13 countries. After the first round the leader is Marko Obradović from Belgrade, Serbia, with only two points advantage over Vlad Klyachin from Moscow, Russia. Behind them with the same number of points are Goran Vodopija (Zagreb, Croatia), Urmas Raude (Muuga, Estonia) and Zoran Tanasić (Belgrade, Serbia). All competitors scored at least one point in the first round. Čedomir Milanović from Kikinda, Serbia was the only participant who scored points in every puzzle. 1. Marko Obradović (Belgrade, Serbia) 48, 2. Vlad Klyachin (Moscow, Russia) 46, 3. Goran Vodopija (Zagreb, Croatia) 36, 4. Urmas Raude (Muuga, Estonia) 36, 5. Zoran Tanasić (Belgrade, Serbia) 36, 6. Čedomir Milanović (Kikinda, Serbia) 35, 7. Andrzej Zolynski (Zielona Gora, Poland) 33, 8. Reiner Biegler (Aix-la-Chapelle, Germany) 32, 9. Iida Takhisa (Yokohama, Japan) 31, 10. Lu Pei (Тaipei, Тaiwan (ROC) 31, 11. Milovan Kovačević (Novi Sad, Serbia) 30, 12. Robert Bearda (Hoofddorp, The Netherlands) 28, 13. Alexander Ershov (Moscow, Russia) 26, 14. Nenad Savić (Belgrade, Serbia) 26, 15. Jiri Hrdina (Roztoky u Jilemnice, Czech republic) 25, 16. Ravi Kumar Macherla (Visakhapatnam, India) 24, 17. Dragan Tolomanoski (Sarajevo, Bosnia and Herzegovina) 23, 18. Rohan Rao (Mumbai, India) 23, 19. Dragan Stojanović (Belgrade, Serbia) 21, 20. Georg Filser (Bad Wörishofen, Germany) 20, 21. Davor Gavranović (Belgrade, Serbia) 18, 22. Anurag Sahay (Hyderabad, India) 18, 23. Zoran Radisavljević (Novi Sad, Serbia) 17, 24. Bjoern Roesel (Giessen, Germany) 16, 25. Slavko Bovan (Kikinda, Serbia) 15, 26. Harmeet Singh (Bangalore, India) 14, 27. Zafer Huseyin Ergan (Eskisehir, Turkey) 14, 28. Gulcin Sabanci (Izmir, Turkey) 12, 29. Tejal Phatak (Mumbai, India) 7, 30. Simana Matković (Sombor, Serbia) 6, 31. Hans-Dieter Hinz (Buchholz, Germany) 5, 32. Ivan Bukumirić (Smederevska Palanka, Serbia) 3. You can look at the complete results scored per puzzle, as well as some of the best solutions our competitors came up with. We hope that the second round will also be successful. The first round of Serbian Open Championship in solving optimizer puzzles was successful. There were more than 30 participants from 13 countries. The results will be posted in a few days. There is no time to rest, because second round puzzles are already in front of you. Please send your solutions to our email address answers@puzzleserbia.com. We remind you that the deadline for submitting your answers is Sunday, December 7th, 10 P.M. Central European Time. The First Serbian Open Championship in solving optimizer puzzles has started. The first round puzzles have been posted. Please send your solutions to our email address answers@puzzleserbia.com. We remind you that the deadline for submitting your answers is Sunday, November 30th, 10 P.M. Central European Time. The first Serbian Open Championship in solving optimizer puzzles, organized by Serbian Puzzle Association, will start on Monday, November 24th. The contest will last two weeks. It consists of two rounds, seven days each. There will be 14 optimizer problems in total, 7 per round. Each puzzle has separate scoring system. The contestant (or contestants) with the best solution receives 10 points, second best solution is worth 8 points, the third 6, the fourth 5, and so on. Eighth-ranked competitor gets 1 point. In each round, competitor's score will be the sum of his five highest results. Two lowest scores will not count. In other words, one can score at most 50 points per round. This means that the contestants do not have to submit all 7 answers, they can skip one or two per round if they choose so. On the other hand, it can be good tactical move to submit all 7. Although you can't receive more points, your rivals might get less. The winner becomes one who scores the most points. In case of the same point total, the tiebreakers will be the following: more "10s", then "8s", "6s", etc; then the score on the 8th puzzle. If the tiebreaker records are still the same, then they will officially share the first place. There is no entrance fee or special application form. Anybody interested can participate. The top ten puzzlers will receive awards via email. The best Serbian competitor will get the trophy and become national champion for the year 2008. 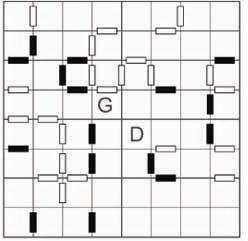 The authors of the puzzles are Nikola Živanović (10 puzzles) and Milovan Kovačević (4 puzzles). Since there will be only two of his puzzles in each round, Milovan has the right to participate, but, of course, not to submit the answers for his own puzzles. The file with the puzzles for the first round will be posted on this website on Monday, November 24th, 10 A.M. Central European Time (CET=GMT+01.00). The deadline for submitting the answers is Sunday, November 30th, 10 P.M. The results of the first round will be posted on Friday, December 5th, the latest. The second round begins on Monday, December 1st. The deadline for the answers is Sunday, December 7th. The final results will be posted on December 12th, the latest. Serbia 8. in the world! Belarussian capital Minsk was the host of the 17. World Puzzle Championship from October 27th till November 1st. At this contest of the world best puzzlers Serbia took the eight place. The best result so far, 16. spot in Borovets in 2006, was overthrown by far. This success was achived by Serbian team members: Nikola Živanović, Dragan Tolomanoski, Marko Obradović, Čedomir Milanović and the team captain Zoran Tanasić. In the individual category among 94 competitors, Nikola was 21st, Dragan 45th, Marko 46th, and Čedomir 51th. The captain Zoran Tanasić competed unofficially and his result would have been good for 72nd place. During the team sets Zoran joined the group of three Indian puzzlers that could not form the full team, so he wrote some history by being the leader of two teams at the sam event! This year, the team sets brought the success to our squad. The 10. set, especially, should be mentioned, as Serbia was, the only team besides Czech republic, that solved the puzzles in time and got bonus points. Even more interesting is that this set consisted of arranging the pictures in order, the type of problem that on previous championships was usually unsolvable. On the top there was nothing new. Although this year there were 17 finalists, the first ranked after the regular sets, Ulrich Voigt from Germany won the title ahead of Mehmet Murat Sevim from Turkey and Roger Barkan from the USA. This was Voigt's sixth title, and since 2000. he did not win only three competitions. In the team category, the best were, as usual, the Americans, behind them the Japanese, and third came Czecs after the outstanding performance on the team sets, although they their team members did not reach the individual finals. Final standings (individually): 1. Ulrich Voigt, (Germany), 2. Mehmet Murat Sevim (Turkey), 3. Roger Barkan (USA), 4. Peter Hudak (Slovakia), 5. Hideaki Jo (Japan), ... , 21. Nikola Živanović, 45. Dragan Tolomanoski, 46. Marko Obradović, 51. Čedomir Milanović. Team standings: 1. USA, 2. Japan, 3. Czech republic, 4. Germany, 5. Hungary, 6. France, 7. Slovakia, 8. Serbia, 9. Turkey, 10. Croatia, 11. The Netherlands, 12. Russia, 13. Poland, 14. The Ukraine, 15. Canada, 16. Belarus, 17. Estonia, 18. Austria, 19. Bulgaria, 20. United Kingdom, 21. Finland, 22. Italy. The complete results with detailed scores by sets are available at the official site of the championship. The finals were very interesting. In the first round there were five lowest ranked finalists. In the next round competed two of them (the fastest solvers of given three problems), as joined by next three from the list. In the final round the top three competitors joined in. This method of competing was interesting, but also very demanding for the finalists, so nobody managed to pass two rounds, and the three "privileged" competitors took the medals. The interesting was that in every round, the contestant sitting on the chair next to the referee Ferhat Calapuklu from Turkey managed to solve the puzzles first, so this chair was, , named "pole position". In the final round, Ferhat was not the referee, but his fellow countryman, Mehmet Murat Sevim from the "pole position" took the silver medal. During the championship, the regular assembly of the World Puzzle Federation was held. Among the other things, the hosts for the championships for the zear 2010 were decided. The Sudoku championship were given to the USA unanimously so they will organize the fifth. WSC in Philadelphia. For the host of the WPC 2010 there was a "battle" between Serbia and Poland. After three rounds of voting, Poland won 12:10 (in the first two rounds the score was 8:8 and 9:9), so our country lost again.The decision was also made that, starting from 2011, the WSC and the WPC will be held together in the same city. If we take into account that Belarus was given the organization, instead of Lithuania only three months ago, we can say that everything was organized at the highest level. The organizers, led by Vladimir Portugalov did excellent job, especiallz regarding the puzzles. Everyone agrees that they have never been better. The excellent organization, good time, and, above all, the great results in Minsk made us forget the problems the team had during our travels, with Russian visas and plain tickets. Some of our photos from Minsk can be seen in the gallery. Serbian Puzzle Association would like to thank everyone who helped the team to go to Minsk and achive this great result. The champion of Serbia in logic puzzles solving for the year 2008. is Čedomir Milanović from Kikinda. As a surprise winner, Čedomir took the title ahead of former champion Dragan Tolomanoski form Sarajevo and Marko Obradović from Belgrade, who lost the big point advantage he had after first four sets. Those three puzzlers, together with the author of the puzzles Nikola Živanović, will be the members of the Serbian team in the next World Puzzle Championship, that will take place in Minsk, from October, 27th till November 1st. The championship was held at Military Veterans Association of Zvezdara and there were fourteen competitors. After couple of hours of solving four sets of problems, the best eight puzzlers went into the finals. Marko Obradović had the great advantage ahead of Čedomir Milanović and Dragan Stojanović from Belgrade. However, after he had made a disastrous error in the puzzle that was worth the most points, he almost lost his place in the Serbian team. Fortunately for him, Dragan Stojanović also made a big error and ended up fourth. Čedomir Milanović seized the opportunity and secured the title. Last year's champion Dragan Tolomanoski was the best when it really mattered and with brilliantly solved final set jumped up from the fifth to the second place. 8. Jelena Đurić, Beograd 284 (448). The final score is the sum of the half of the points scored in the first four sets and the points from the final set. The author of the puzzles was Nikola Živanović, the team captain. The standings of the rest of the competitors: 9. Milovan Kovačević, Novi Sad (372), 10. Zoran Radisavljević, Novi Sad (339), 11. Nenad Savić, Beograd (267), 12. Slađana Milojković, Zaječar (255), 13. Slobodan Najdić, Beograd (224), 14. Aleksandar Lukić, Pančevo (211). Serbian puzzlers had outstanding results on very prestigious contest on Turkish internet site TurkZeka. Zoran Tanasić took fourth, and Čedomir Milanović sixth place among 214 participants. Our third competitor, Milovan Kovačević was 26. and had he not skipped four rounds, his result would have also been in top ten. The first two were Japanese puzzlers Yoichi Enta and Takanori Fujii, and the third was Meng-Hsuan Wu from Chinese Taipei. If we compare the average scores achived by competitors from the same country, then Serbia can be considered the most successful. Our three competitors got in average 1128 points, the second is France (two competitors) with 1115, the third is Czech republic (three competitors) with 956, etc. Zoran Tanasić and Helen Roberts from Great Britain were the only contestants who solved 9 out of 10 given puzzles, while all the others had less correctly solved problems. You can look at the complete results and the official statistics of the contest, and the other informations are available at the TurkZeka internet site. The Fourth Serbian Puzzle Championship will be held on Saturday, September 6th in Belgrade. The event will take place at Military Veterans Association of Zvezdara, located in 9a Duško Radović Street, Mirijevo (see the map). The competition starts at 10 A.M . The author of the puzzles, Nikola Živanović, has posted the instruction booklet for the forthcoming championship. 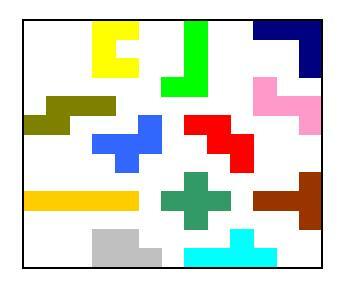 Every puzzle is illustrated with a simple example. The instruction booklet is available in Serbian in PDF format. 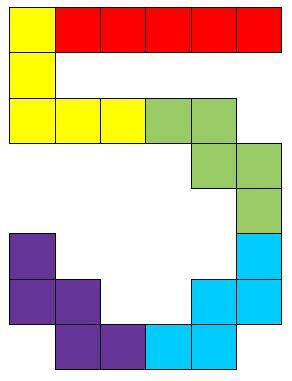 You can ask author questions about these puzzles on his blog. 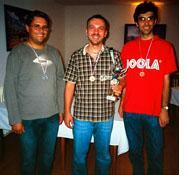 As previously announced, the fourth Serbian Puzzle Championship will be held on 6th of September 2008. The place will be soon decided between Belgrade and Novi Sad. The championship is also qualifying - the best three competitors will qualify for the next World Puzzle Championship in Minsk. Everybody has right to participate. The applications should be sent by e-mail before 20th of August. For members of Serbian Puzzle Association, participation is free, others will pay the fee of 800 dinars. The author of the puzzles, Serbian champion Nikola Živanović, will post the booklet with puzzles on this site on 6th of August. On 14th of June 2008. the world's most popular puzzle contest, the US Puzzle Championship was held. Six hundred puzzlers from all over the world took part in it, and among them ther were ten participants from Serbia. 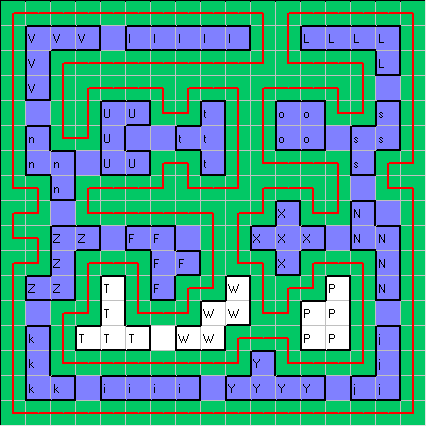 The contest was held via internet, it lasted two and a half hours, and there were 20 puzzles to be solved. The US champion again became the reigning world sudoku champion Thomas Snyder with maximum 365 points. Our best competitor was our champion Nikola Živanović, who got 248 points. The results of our puzzlers are: Čedomir Milanović 170, Marko Obradović 164, Dragan Tolomanoski 160, Dragan Stojanović 120, Vesna Jovanović 117, Zoran Tanasić 102, Slađana Milojković 95, Milovan Kovačević 89, Jelena Đurić 85. On US puzzle championship website you can see the complete results, as well as the puzzles from the contest. The host of World Puzzle Championship 2009 will be Turkey , it was decided by votes of countries members of the World Puzzle Federation. Turkey got fifteen votes, while Serbia, only other candidate, got three. The WPF thanked Serbian Puzzle Association for participating, and encouraged Serbia to run again for hosting 2010 event. The Turks will organize the championship in Antalya or Kapadokya. Our puzzlers performed very well at the 9th championship in 24-hour logic puzzles contest that was held from 7th till 9th of June in Budapest. Nikola Živanović took the third place, although during more than half of the competition he was in the lead. Čedomir Milanović was 17th, Milovan Kovačević 19th and Zoran Tanasić 22nd. The winner of this logic marathon was Michael Ley from Germany , while second came last year's champion, Hungarian Zoltan Horvat. 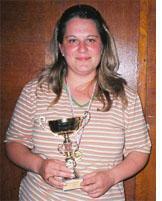 The fourth Serbian Puzzle championship will be organised by SErbian Puzzle Association on 6th of September 2008. This competition will also be the qualification for this year's World Puzzle Championsip that will take place in Belarus from 27th of October till 1st of November. Besides Nikola Živanović, who is going to make the puzzles, three best competitors will earn their place in Serbian national team. The championship is open for everyone interested and for the members of Serbian Puzzle Association the entry is free. During world sudoku championship in India, an unofficial meeting of World Puzzle Federation (WPF) leaders with team captains was held, and we have good news. Serbia became a candidate to organize the World Puzzle Championship 2009. The voting will be done via internet from 1st till 8th of June. Besides Serbia, other candidates are Belarus and Turkey. Four Serbian sudoku team members came back from India , where they successfully participated at the third World Sudoku Championship that was held from April 14th and 17th in Goa. National champion Nikola Živanović from Sombor came 18th among 89 competitors from 30 countries. Bojana Vojnović from Belgrade was 39th and improved her result by 73 places, as at the last year's championship she was 112th. Serbian vice-champion Dragan Tolomanoski from Sarajevo finished 41st, and Dragan Stojanović from Belgrade 47th. In team category, Serbia finished 13th, which is three spots lower than last year. Thomas Snyder from USA has successfully defended his world sudoku title, winning ahead of Juhei Kusui from Japan and Jakub Ondrušek from Czech republic. In classic sudoku category, the “superquick” American won once again, with better time than David McNeill from Great Britain and Michael Ley from Germany. In the team category the winner was Czech republic, second was Japan , and third was Germany. Serbian team managed to travel to India thanks to new president of Serbian Puzzle Association Zoran Tanasić, and donators that covered plain ticket expenses. On 24th of February 2008. the first scheduled session of Serbian Puzzle Association (SZS) was held in Belgrade. Zoran Tanasić was elected to be the president of the organization. On Sunday, 9th of December 2007. the Third Serbian Sudoku Championship was held in Music school "Mokranjac" in Belgrade. After three sets of problems, of which some were very difficult, Nikola Živanović from Sombor took the gold medal, having collected 64 out of maximum 88 points. Dragan Tolomanoski from Sarajevo came second, while the third came 18-year old Bojana Vojnović from Belgrade, with the same number of points as Tolomanoski, but with weaker tiebreaker record. The fourth member of the Serbian team for WSC 2008 in India is Dragan Stojanović from Belgrade, and the first reserve is Vesna Jovanović, also from Belgrade. The problems were created by eminent Croatian puzzlers Siniša Hrga and Alfredo Ivankov, and the tournament's official was Zoran Radisavljević. The MENSA association helped SZS with the organization. Final results: 1. Nikola Živanović 64, 2. Dragan Tolomanoski 56, 3. Bojana Vojnović 56, 4. Dragan Stojanović 50, 5. Vesna Jovanović 47, 6-7. Marko Obradović, Branko Ćeranić 44, 8. Nebojša Vlajsavljević 34, 9. Marija Jovanović 33, 10. Ana Jovanovska 32, 11. Stevan Todorović 30, 12-13. Slađana Milojković, Jelena Đurić 29, 14-15. Boris Majić, Nenad Pirgić 26, 16-19. Milovan Kovačević, Nina Maksimović, Luka Rabrenović, Ivana Jelić 24, 20. Jasmina Škrijelj 23, 21-23. Čedomir Milanović, Željko Skorić, Miloš Todić 22, 24-26. Jadranka Ogrizović-Milojković, Vigor Majić, Slobodan Najdić 20, 27. Zoran Milovanović 18, 28. Iskra Jovanovska 15, 29-31. Tatjana Raičević, Nenad Savić, Zoran Tomić 14, 32-33. Aleksandar Lukić, Zoran Tanasić 13, 34. Dragutin Golubović 12, 35. Života Živković 7, 36. Jelena Dimov 4. The most attractive Brazilian city of Rio de Janeiro was the host of the 16. World Puzzle Championship. Serbian competitors did well, even though due to the expensive plane tickets, the team was not at the full strength. Facing the very tough competition, notable results achived Nikola Živanović (19th place among 95 competitors) and Dragan Tolomanoski (33th), while Marko Obradović (83th) and Zoran Radisavljević (89th), besides their enormous efforts ended the competition in the bottom part of the list. Our best puzzler Nikola Živanović, twice finalist of World Sudoku Championship, proved his class, and if he had not done the final set so badly, he would have made the finals. The final set was poorly done by all our team members, so Serbia took 17th place among 23 countries, altough during the whole championship we were 14th. At the end, after lots of incredible mistakes and blunders, we were only few points short of 15th place, which would have been our best result ever. Before the competition there was fear that the inexperienced organizers could make some erroneous or dubious problems. Unfortunately, the fear was justified, and after some accepted appeals there had been some major changes in the final ranking. Croatian team member Goran Vodopija was the unluckiest one, as he went to bed as a finalists and woke up the next morning as spectator of the final round. To add the insult to the injury, Hungarian Pal Madarassy, who had replaced him became the winner. The results were arriving very slowly, and for the semifinal and final rounds the organizers did not give the copies of the problems to the audience. Luckily for the hosts, the charming sites of Rio made the competitors forget all the inconveniences. In team category USA team was the absolute winner, second place went to Japan, and the third was Belgium. Germany, who was among the medalists throughout the whole competition made the crucial mistake in the last set and got zero points. This last set was very interesting. The participants had to make the “incredible machine“ using office material (paper clips, rulers, pencils, erasers, sharpeners, scotch tape) that would transport the marble from point A to point B. The Germans, instead of making something simple and receiving 900 points, tried some tape-pendulum contraption which did not work so they descended from 2nd to 9th place! The best machine was made by Japanese (24 seconds), while Serbian “craftmen“ made the contraption that worked for about three seconds. However, we showed them that we are basketball-nation, as only our marble was thrown directly to the “ basket ” . Final results (individual): 1. Pal Madarassy (Hungary), 2. Thomas Snyder (USA), 3. Ulrich Voigt (Germany), 4. Okamoto Ko (Japan), 5. Taro Arimatsu (Japan)... 19. Nikola Živanović, 33. Dragan Tolomanoski, 83. Marko Obradović, 89. Zoran Radisavljević. Team results: 1. USA, 2. Japan, 3. Belgium, 4. The Netherlands, 5. France, 6. Czech republic, 7. Hungary, 8. Poland, 9. Germany, 10. Canada, 11. Turkey, 12. Croatia, 13. India, 14. Austria, 15. Brazil, 16. Bulgaria, 17. Serbia, 18. Romania, 19. Slovakia, 20. Argentina, 21. Russia, 22. Italy, 23. Peru. Serbian team received sponsorship from Lipaks, Wiener Stadtische, Continental bank, Banbus transport and Ministry of sport and youth of AP Vojvodina. Worth mentioning is the gesture of Will Shortz, american puzzler, who sponsored our best competitor Nikola Živanović. 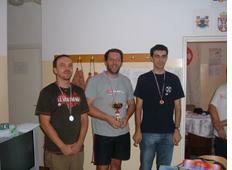 The third Serbian championship in logic puzzles was held in Novi Sad on 12th of August. There participated 14 competitors and the new champion became Dragan Tolomanoski from Sarajevo, who collected 375 out of possible 480 points. The same score, but with weaker tiebreaker record, had the "invincible" Nikola Živanović from Sombor. The second surprise was Marko Obradović from Belgrade, who was in the lead after first set, performed well in the other sets too, eventually winning the bronze medal. The fourth member of Serbian team will be Jelena Đurić, who had only half a point more than Dragan Stojanović. Among the newcomers, the best was Čedomir Milanović, who would have had chances to win a medal, if he had not done poorly the first set. The tournament official and the puzzlemaker was Zoran Radisavljević, and Stjepan Varaždinac from Orahovica and Adnan Spahić from Tuzla helped him. This was so far the most unpredictable competition, which proves that we have many more puzzle solvers for the future. Everyone will remember 8. Tomislav Munišić's memorial, held on the 30th of June and 1st of July in Čačak, as beautiful event. Agile organizers, led by Radoje Damljanović (one of the participants in sudoku championship), made the enormous efforts to make this event success. They are the big favourites to organize the event next year, too. The atmosphere was excellent, the accommodation in “ Morava ” hotel was good, and the prizes for winners were surprisingly valuable. Beside that, the hosts prepared sudoku-cake, that had “Svi ste pobednici” (all of you are winners) written on it. Well done! Velibor Marjanović, and the third place went to Slavko Bovan who defeated Miša Obradović. The tournament was very dynamic, and before the last round six participants had chances to win the medal. Tournament results: 1.Velibor Marjanović (Valjevo) 8:1, 2. Marko Obradović ( Beograd ) 7:2, 3. Miša Obradović ( Beograd ) 6:3, 4. Slavko Bovan (Kikinda) 6:3, 5. Sreten Perić (Loznica) 5:4, 6. Zoran Radisavljević 5:4 ( Novi Sad ), 7. Nenad Savić ( Beograd ) 3:6, 8. Nikola Živanović (Sombor) 3:6, 9. Dragan Tolomanoski ( Sarajevo ) 2:7, 10. Zoran Kotarac (Valjevo) 0:9. The side event was the 7th Serbian Anagrams Cup. There were eleven anagrammatists who created anagrams for three given subjects, and the referee was Zoran Radisavljević. Sofija Necin from Novi Sad won the first place unexpectedly, but deservedly. Second came Milan Milin from Srbobran, and the third was Nikola Živanović from Sombor. Final results: 1. Sofija Necin 18, 2. Milan Milin 18, 3. Nikola Živanović 12, 4-5. Velibor Marjanović, Slavko Bovan 11, 6. Nenad Savić 9, 7-9. Sreten Perić, Dragan Tolomanoski, Marko Obradović 4, 10. Miša Obradović 2, 11. Zoran Kotarac 1. There were no surprises on sudoku tournament. Our best sudokist, Nikola Živanović, won the first place ahead of Dragan Tolomanoski. The third place went to Marko Obradović. Preliminary round results: (7 problems in 65 minuts, maximum 160 points): 1. Nikola Živanović (Sombor) 135, 2. Dragan Tolomanoski ( Sarajevo ) 110, 3. Bojana Vojnović ( Beograd ) 105, 4-5. Marko Obradović ( Beograd ), Marija Jovanović (Valjevo) 85, 6-7. Jadranka Ogrizović-Milojković (Vršac), Slađana Milojković (Zaječar) 60, 8. Nenad Savić ( Beograd ) 50, 9. Milan Milin (Srbobran) 35, 10. Jelena Kozoderović (Vršac) 25, 11. Jasmina Ćirić ( Beograd ) 15 poena. Final round (2 problems in 25 minuts + bonus from preliminary round): 1. Nikola Živanović 120 (105 + 15), Dragan Tolomanoski 108 (98 + 10), 3. Marko Obradović 89 (89 + 0), 4. Marija Jovanović 84 (84 + 0), 5. Bojana Vojnović 64 (59 + 5). Serbian Puzzle Association, organizer of the event, prepared the medals, trophies and other prizes for best competitors.